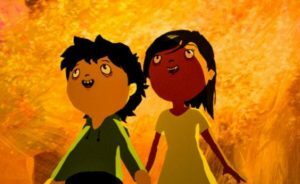 Every few years, TAAFI (the Toronto Animation Arts Festival International) hits the city to showcase the very best of animation from around the world for audiences to enjoy. This weekend, TAAFI returns for its latest edition and the films being shown are certainly an exciting bunch. The biggest attraction will be a showing of DreamWorks Animation’s third chapter in its popular film franchise about Hiccup the Viking and his beloved dragon Toothless, How to Train Your Dragon: The Hidden World. Director Dean DeBlois and lead voice actor Jay Baruchel will also be on hand for a special Q&A after the screening on Saturday night. TAAFI’s opening night presentation, meanwhile, will be the Hungarian animated film Ruben Brandt, Collector, about a psychiatrist who teams up with a band of criminals to steal some priceless paintings. Hailing from Brazil, the feature film Tito and the Birds is a particularly inventive and imaginative animated feature showing the rise of an epidemic. Directors Gustavo Steinberg, Gabriel Bitar and Andre Catoto create a social commentary with an emphasis on the media and a fear mongering government. Their lead child protagonists allow for some humourous observations and the strange imagery results in a unique experience. The drawing style, mixing hand-drawn animation with Flash animation, adds another level of creativity to Tito and the Birds, as the backgrounds whoosh by the characters during the action scenes. Brazil has started to become a major force in the international animation scene and this is yet another example of the strong work coming out of the country. For a similarly bizarre, out-there and certainly more adult animated feature, there is the French-Japanese co-production MFKZ. Based on a series of graphic novels, the movie manages to mix the styles of both countries for a wild depiction of the United States through foreign filmmakers’ eyes. It’s certainly an unpredictable film with all sorts of unusual plot twists at every turn. Each character is able to be unique and stand out, from the main protagonist Angelino to a hyperactive nervous bat named Willy. There is action and gunfire aplenty and even some Mexican wrestlers, because why not? MFKZ certainly won’t be to everyone’s tastes, but one has to admire how much it throws against the wall. TAAFI will also be featuring a wide variety of animated shorts from around the world. Done using computer, hand-drawn and stop-motion animation and all with different art styles, it shows the amazingly diverse and creative number of voices rising out of animation schools and studios. Some of these are funny little stories, while others are more dramatic and there are a few music videos thrown in for good measure. For families, the “Saturday Morning Fun Time” collection of shorts will probably be the best bet for some great early day fun, with the highlight being an episode of Netflix’s delightful Annie Award-winning animated series Hilda. TAAFI will be playing at the Hot Docs Cinema on the weekend of February 15-17. Tickets are available to purchase on the official TAAFI website.